Home Biafra featured UNARMED IPOB TERRORIST ORG , ARMED FULANI HERDSMEN NOT TERRORISTS BY LAI MOHAMMED. UNARMED IPOB TERRORIST ORG , ARMED FULANI HERDSMEN NOT TERRORISTS BY LAI MOHAMMED. Written by Mr Azubuike Francis. Why Nigeria did not declare Fulani herdsmen as terrorist by Lai Muhammed. Truly the Mohammed that I know had no lie accredited to him, but unfortunately this Mohammed lies a lot. By that news excerpt, Lai Mohammed used lies and deviated from the point he should have made that qualified IPOB as terrorists instead of Fulani Herdsmen. Fulani herdsmen are never terrorists because they believe in action and not by words unlike IPOB who in view of self defense due to the lost of faith in the Nigeria state to protect innocent and unarmed Biafrans did Nnamdi Kanu solicited for possible arms. Nnamdi Kanu's reason was clear. By virtue of records of extra judicial killings in the hands of Nigeria security forces and the Presidency, Nnamdi Kanu sought for appropriate deterrent as Biafrans could not continue to be always at the receiving end of blood thirstiness of Housa-Fulani. 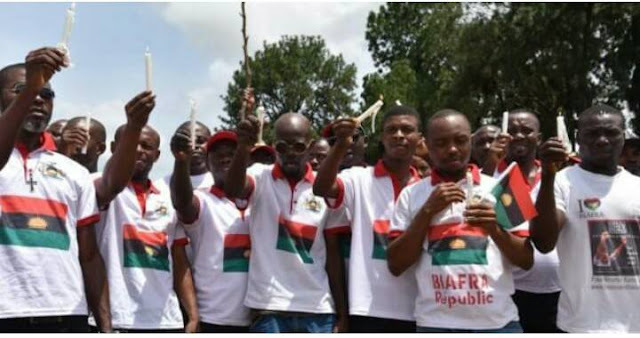 Of course, if IPOB had taken up arms in similar way as Niger-Delta Militants, they would not have been proscribed and called terrorists. If Nnamdi Kanu had engaged in Gorilla war fare against the Nigeria armed forces, the Nigeria government would have sought for a more appealing name to tag IPOB. May be not taking up arms might have been the Greatest Mistake of IPOB and Mazi Nnamdi Kanu. From the Lai Mohammed and Buhari concept, that is what they expected to be able to cleanly delete criminals tag on Fulani Herdsmen. Interestingly, Mazi Nnamdi Kanu and IPOB never took up arms as alternative option thereby attracting more acceptance by the International community thereby causing more mockery and haters for Nigeria. Nigeria is and would always forcefully understand the language of dialogue by force even if it be insincere dialogue which has always been the case, because no nation lies to its citizens the way Nigeria does. Nigeria the Rogue ZOO of a nation that understands only Violence and lies has been well represented by a Mohammed that lies. I bet you, with this trend, Nigeria would go down in Violent disintegration. It is inevitable reality! There is a point that resonates from the mouths of Mohammadu Buhari, his spokes persons and other educated illiterates within the so called elites and the presidency. The point has always been ignored or still not having been gotten by the majority. That point has always come in the expression that Unity of Nigeria is not negotiable. In any society where the terms for the cooperate existence of people can not be negotiated, that society can not be said to be democratic. Nigeria under Mohammadu Buhari is not a democratic nation. A rogue, a tyrant, a dictator, an autocrat is ruling Nigeria. Unfortunately, this simple point eludes educated illiterates of Nigeria. If the cooperate existence of Nigeria is not negotiable, then what else should be deemed negotiable... ? If you can negotiate issues and ignore cooperate existence of Nigeria, then you are a coward, an IDIOT and a ROGUE. If Bakassi Peninsula could be ceded to Cameroon with a negotiated Nigeria-Cameroon Boundary Commission put up for re-mapping of the Nigeria-Cameroon Boarder, then Olusegun Obasanjo is a coward, an IDIOT and a ROGUE. So are General Yakubu Gowon and Mohammadu Buhari cowards, IDIOTS and ROGUES. When violent is being ascribed to IPOB, one would wonder where the violent came from; may be from peaceful assembly... , may be from peaceful protests and by violently using raw truths in dealing with Nigeria ZOO of a nation. I hope that is the violent justification of IPOB. For one thing that is clear, Mazi Nnamdi Kanu and IPOB have used VIOLENT TRUTH to attack Nigeria government. With this, Nnamdi Kanu has initiated a new form of violent and terror that every nation and the world should be very careful of - A VIOLENT TRUTH FORM OF TERRORISM. Maybe the IPOB youths would troop out en mass to vote for South East governors who have failed to protect their interests. If IBOP and the entire Biafra land continue to participate in Nigeria elections, then Mazi Nnamdi Kanu must never be blamed for the continued enslavement of Biafra people, and any future clamor for Biafra or complain of marginalization would mean a pool of tears less value that a crocodile's tears. IPOB must back their position with actions of civil disobedience. Nnamdi Kanu is just a mouth peace, you and I are the Biafrans and we must consolidate our quest for freedom based on the platform set by Mazi Nnamdi Kanu. Boycott elections beginning from Anambra state. IPOB is never over, and Biafra will never be over. As Olusegun Obasanjo struggles with credible answers over Biafra, Lai Mohammed would continue to struggle for credible answers, Mohammadu Buhari would still struggle for answers with Al Jazeera. The International community watches while Nigeria stinks over Biafra, IPOB and Mazi Nnamdi Kanu. Shame on Buratai! Days of re conning lays wait.